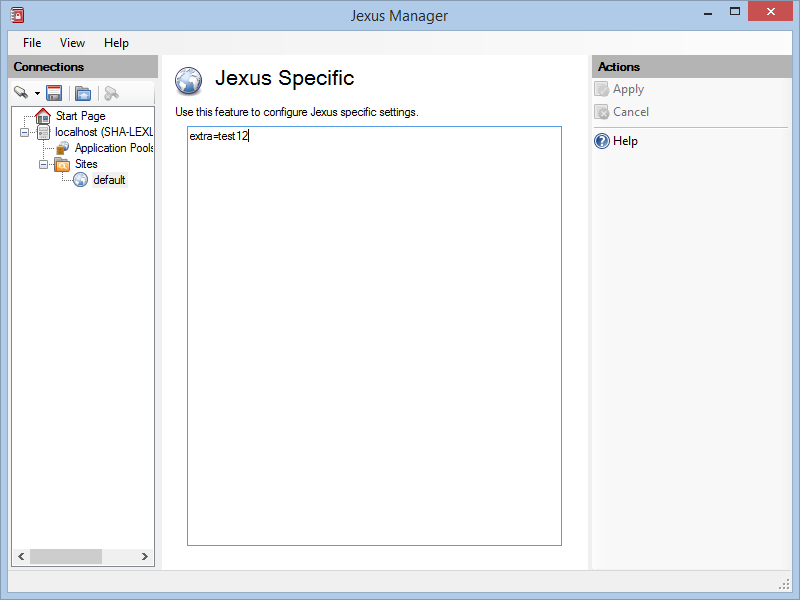 This page shows you how to use Jexus Manager to manage Jexus specific settings. Jexus web server does have some special settings that are not yet mapped to IIS configuration system. However, Jexus Manager hasn’t been tested against Jexus web server for a long time, so the related code might not work as expected. More information can be found from Remote Services release page. Jexus Manager displays a Jexus page for every Jexus web servers it manages. Since Jexus settings are stored as key-value pair, this simple editor allows you to modify the pairs freely and apply the changes at will when everything looks good to you. If you are not sure of any setting, you can click the Help link and navigate to our documentation site.